Vessels such as this example of cast and incised brass known as kuduo were used by the wealthier Asante people of Ghana as lockable containers for valuables such as ritual objects and gold dust. Others might have been buried with people of status. Some might have been used to hold a mixture of shea butter (derived from a natural oil extracted from the but of the shea tree) and gold dust used to adorn the corpses of high-status chiefs. 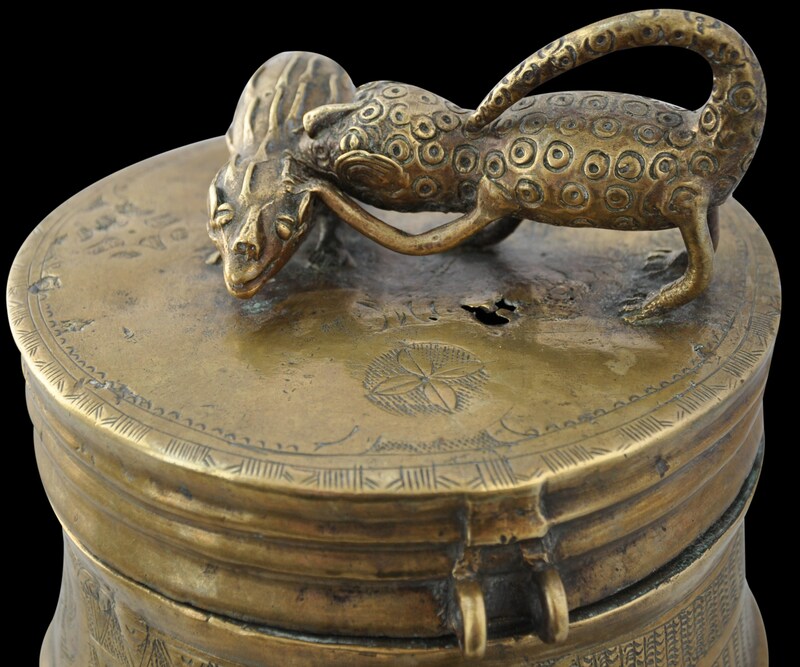 Importantly, this example has obvious age and wear: most noticeably, the tail of the leopard attached to the top of the lid serves as an obvious handle to pull the lid open and this has been worn smooth on the top from decades of handling. The tiered body is embellished with geometric designs reminiscent of Islamic motifs. 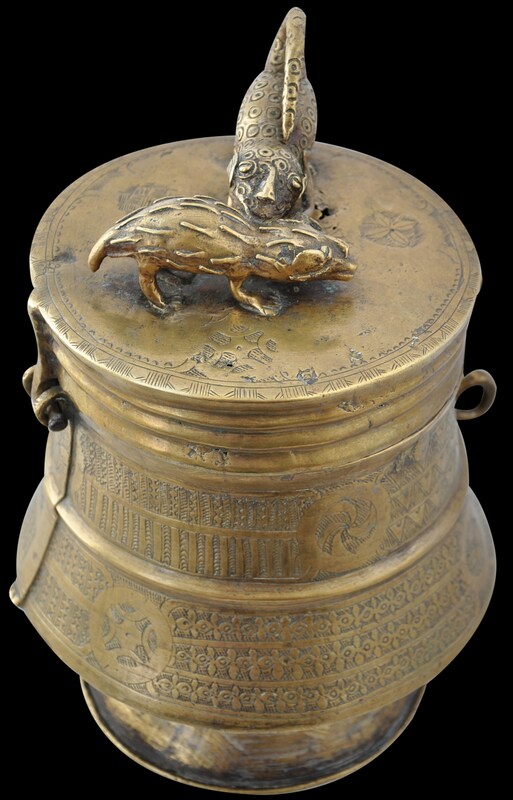 The hinged lid has a cast, three-dimensional spiny anteater being attacked by a leopard, which Preston Blier (2004) suggests is a possible reference to the power of the Asante king. 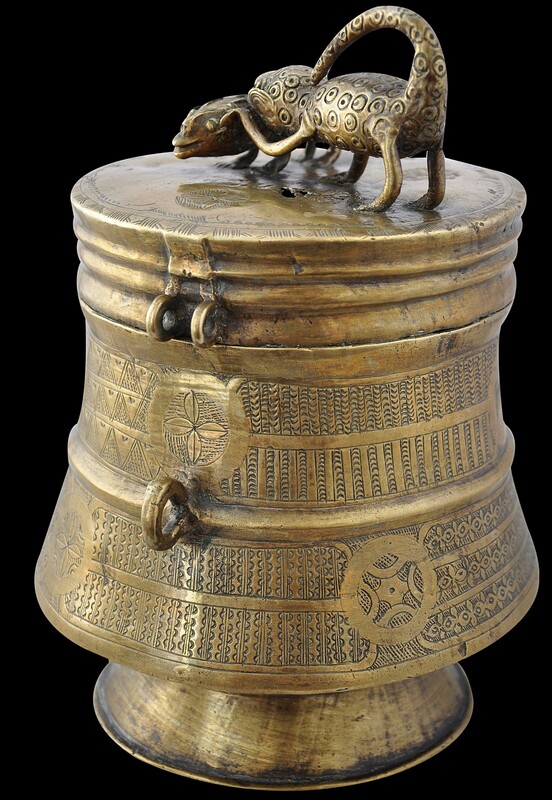 She also suggests that the basic form of the vessel and the decoration might derive from the canteens of Arab traders who crossed the Sahara, observing that similar designs appear also on Asante cloth. Vessels with figural groups often come from Kumasi, the Asante capital. A very similar example in the Teel Collection which is attributed to the late 19th century is illustrated in Preston Blier (2004, p. 86). Another example, from the Maurice Bonnefoy Collection, is illustrated in Robbins & Ingram Nooter (1989, p. 201). Several other similar examples currently are displayed in the British Museum. 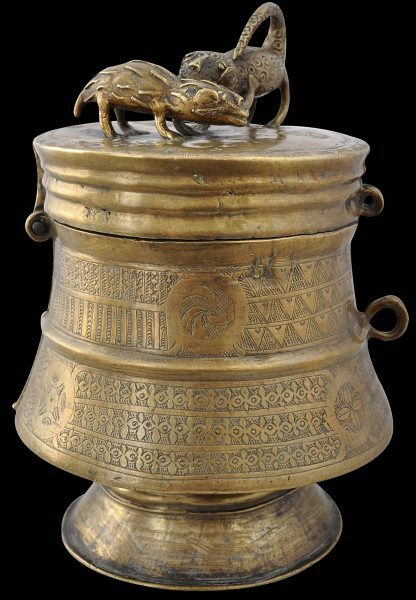 A comparable example from the Paolo Morigi Collection, comprised lot 81, in Sotheby’s ‘Collection Paolo Morigi: Important Art Africain’ sale, Paris, June 6, 2005. (Estimate: euros 6,000-9,000). 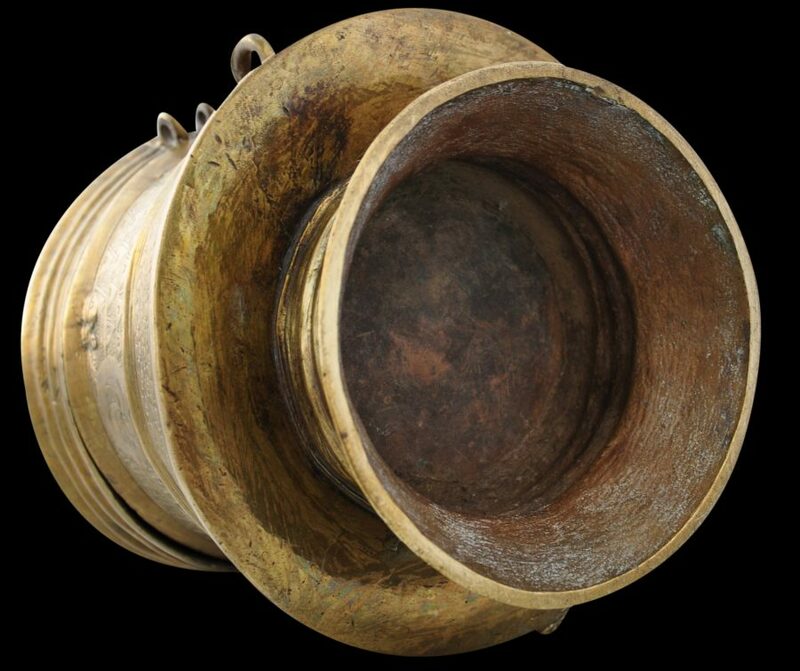 Although large, one of the uses for this vessel might have been to hold gold dust which became the currency used to settle everyday transactions. Each party to any transaction would typically use their own weights. 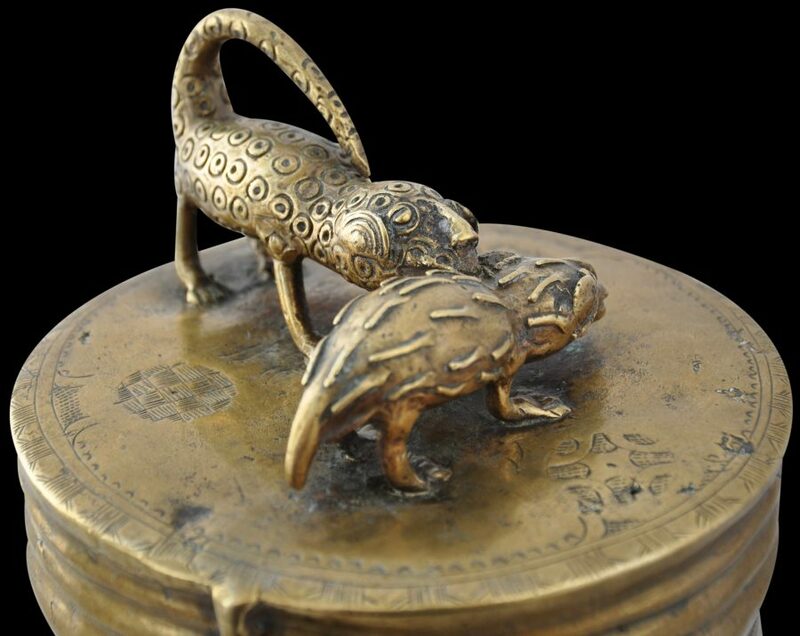 The negotiating process not only would include the cost in gold dust of the items being transacted over but also a comparison of weights, debate over the scales used and the purity of the gold dust (gold often was adulterated with brass filings). Even transactions as rudimentary as buying vegetables in a street market necessitated this process. 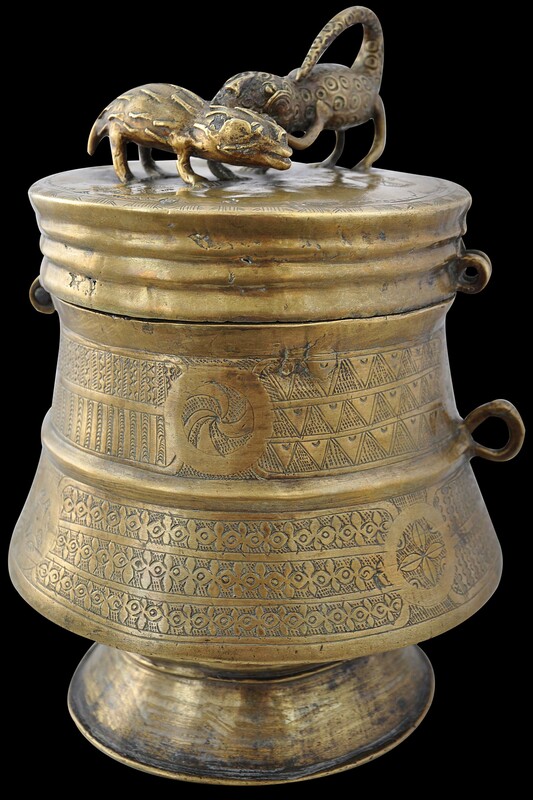 Gold became an important commodity which gave rise to Ghana’s old colonial name of the Gold Coast. The region was known as the Gulf of Guinea and in England, a gold coin worth twenty-one shillings became known as a guinea (Phillips, 2010). This example has excellent patina and age-related wear. A small hole in the fabric of the top of the lid is either due to casting or wear. Overall, it is a fine example of a type represented in several important collections. 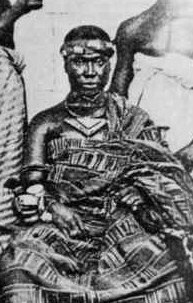 The Asante king Prempeh I, late 19th century. His dress has the same types of geometric motifs as appear on thiskuduo. Robbins W.M. & N. Ingram Nooter, African Art in American Collections, Smithsonian Institution Press, 1989. Preston Blier, S., (ed. 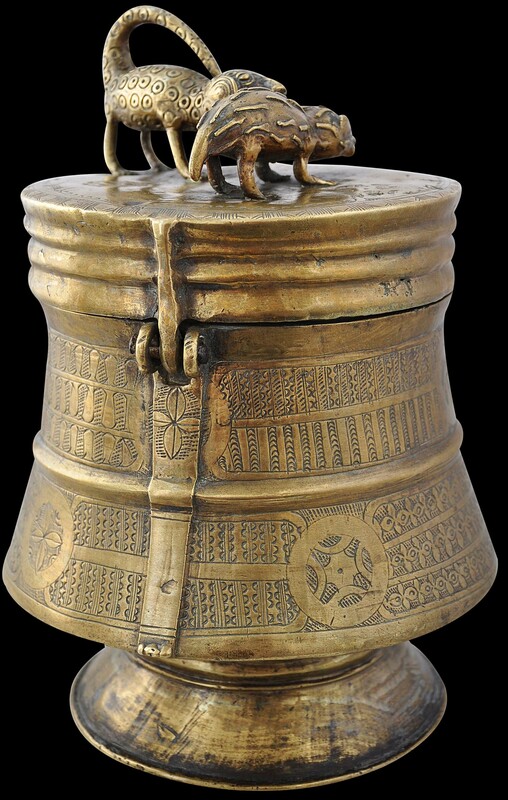 ), Art of the Senses: African Masterpieces from the Teel Collection, MFA Publications, 2004. 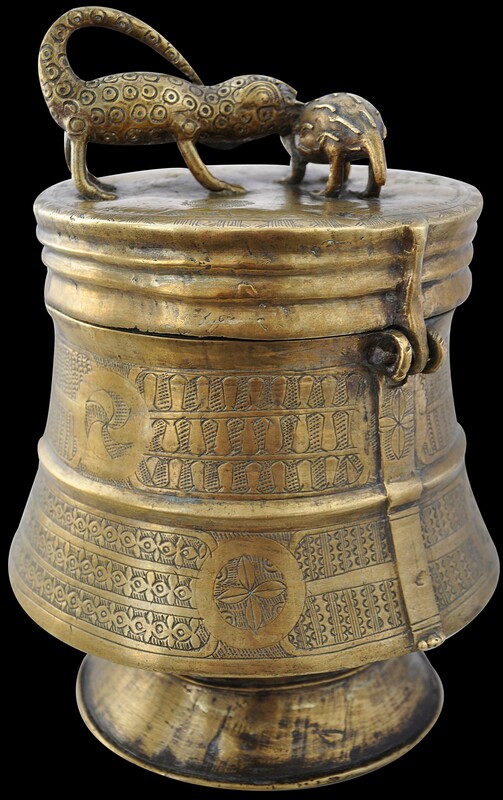 Phillips, T., African Goldweights: Miniature Sculptures from Ghana 1400-1900, Edition Hansjorg Mayer, 2010.